Congratulations on taking the time out to learn more about the science behind the All Natural High 'digital drug'. All Natural High is an audio recording, which uses special sounds to help shift your brainwave patterns - recreating states of euphoria, excitement and mental agility. Every state of mind has a particular "signature" attached to it. This is represented by your brainwave patterns (or "frequency"). For example, if you're in a state of deep focus, your brainwaves are likely to be in the Alpha frequency range of 8-12Hz. Other specific frequency patterns exist for states such as sleep, creativity, and general happiness. In the 1830s, scientists discovered that by playing certain frequencies through the ears, the brain "followed" those frequencies. This is a powerful process known as "brainwave entrainment." By changing your brainwave frequencies, you could change your state - encouraging focus, creativity, sleep, or mood improvement, for example. The problem was that the human ear can only hear frequencies of around 20Hz to 20,000Hz - whereas the vast majority of 'useful' human brainwave frequencies exist at 0.1Hz to 20Hz. The brain then followed (or entrained) toward this frequency, and brought about the exact state of mind desired - such as deep focus. 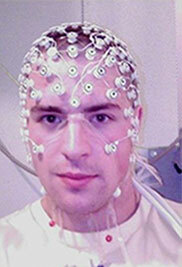 This was the scientific validation of "binaural beats," the first true brainwave entrainment method. Originally suggested in the 1830s, it was scientifically verified by EEG machines in the 1950s. Since then, many other methods of brainwave entrainment have been discovered - including monaural beats, hamonic box X beats, and most powerfully, isochronic tones, typically regarded as the most potent entrainment methods availabl. The most powerful brainwave entrainment sessions typically incorporate several entrainment techniques into each session, in order to produce the strongest results, as with All Natural High. Since the 1950s, and with the advent of sophisticated computer technology, brainwave entrainment recordings have moved significantly forward. Further brainwave research has led scientists to uncover the exact brainwave "signatures" for states such as sharp focus, reinvigorating sleep, mood improvement, increased energy, and more. More modern and precise entrainment techniques, using computer-generated audio, have also been developed. This has led to the development of powerful "audio pill" sessions for major uses, from leading providers such as Sonic Vitamins - and, of course, industry-leading sessions such as All Natural High. All Natural High is designed to recreate the mental state associated with euphoric stimulants – an edgy feeling of excitement and anticipation. The session also mellows this buzz with steady feel-good beats. All Natural High is an example of a complex 'brainwave entrainment' session. At its core, All Natural High uses several brainwave entrainment methods - multiple entrainment frequencies applied by amplitude modulated noise, isochronic beats, harmonic box X beats and binaurals, all formed through interaction between entrainment pitches - to manifest states of mind and feelings naturally. Adding emphasis to these beats, there are all manner of sounds carefully selected for their stimulus-inducing responses and expressive characteristics. All Natural High is designed to recreate the mental state associated with euphoric stimulants, but unlike other stimulants it’s non-invasive and completely non-addictive. The primary frequencies used in All Natural High are alpha and beta. A mixture of different pitches and stimuli make it possible for both frequencies to be present at the same time. Beta rhythms occur when we are focused, engaged, and enthusiastic, while alpha rhythms encourage relaxed awareness. All Natural High uses rapidly changing beta/gamma range frequencies (14-44Hz) to stimulate and support rapid shifts in mental focus. The 10Hz alpha frequency is also used, and is specifically associated with serotonin. A stable 10Hz beat also mellows the intense beta/gamma effect. There are also several types of gamma stimulation present in the session. Gamma activity is associated with higher thought, and is frequently used in energizer-type sessions. There is still debate about the full function of gamma, but it is relatively certain that it is the “glue” that binds what you see and what you think. In a session like All Natural High, its purpose is to maintain alertness and responsiveness. Most of the gamma you will hear as a hiss or a flutter. A pure 40Hz gamma track encourages general mental energy, while the random gamma encourages inspiration. All Natural High comes in two versions - one with upbeat background music that you can listen to at any time, and one which is purely synthetic - so that you can listen while playing other music, or just on its own. The All Natural High session is dynamic, meaning that the effects will depend a great deal on the circumstances of its use, especially how readily you let go and “get into it”. You can use the All Natural High session passively - by simply slipping on your headphones and listening - or while doing something else, allowing it to support real-world fun. To use it, simply play the main track (with the upbeat background music) - or play the synthetic version in the background, either on its own, or while listening to other music. Perfect for a "pre-game psych-up" - no matter what game you're talking about - and ideal for playing in the background at parties or other events. In such situations, please advise all guests of health warnings beforehand. A special treat with All Natural High is to use it with Winamp/MilkDrop. The MilkDrop visualiser, driven by All Natural High, provides the ideal visual stimulation to maximise the effects. Try a big screen and big sound! If you want to try MilkDrop and listen to your own music, use Winamp/MilkDrop to play All Natural High and another media player to play your music – that way the MilkDrop visuals will correctly follow the All Natural High beats. Full instructions and further listening suggestions are provided in the full user manual that comes with each copy of All Natural High. You can preview the guide by clicking here. Note: All Natural High may induce sensations of anxiety in some individuals – this is usual for strong beta sessions. If this occurs, try relaxing or meditating first - or discontinue use until you have a quieter mind.